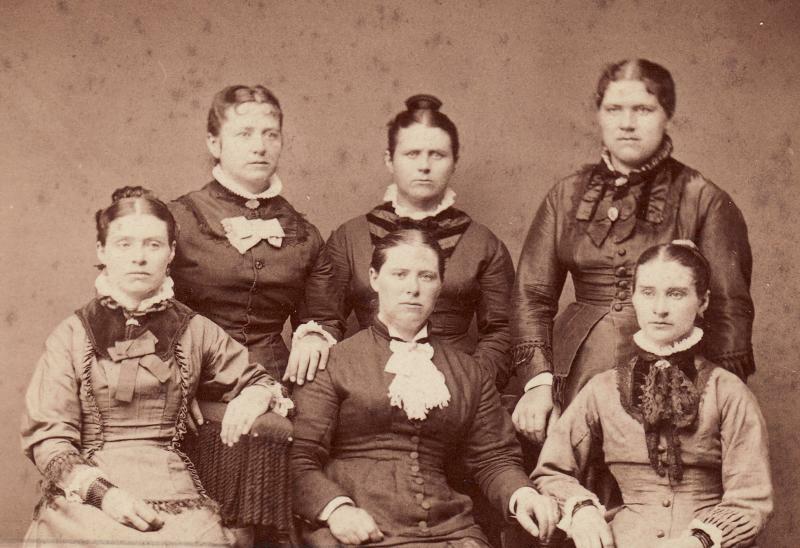 Comments: Henrietta Kinmonth (Nee: Atherton) | United States | 1851-1900 | Comments: Handwritten inscription on album page reads, "1st row / Lucetta (Atherton) DeWolf / Hester Ann (Atherton) Kinmonth / Paulina (Atherton) Haxton / 2 row / Nancy (Atherton) DeWolf / Henrietta (Atherton) Kinmonth / Minnie (Atheron) Winder." On the reverse of the photograph is written, "Left to right: Lower row / 1. Nancy Dewolf / 2. Henriette Kinmonth / 3. Minnie Winder / upper row / 1. Lucetta Dewolf / 2. Hester Kinmonth / 3. Paulina Haxton / Atherton sisters / 7 sisters / Jane Laferty dead / on the opposite page." TRANSCRIBERS NOTE: A photograph of Jane is on the next page in the album, which is obviously what is being referred to in this inscription. Original, professional photograph from J. W. Emery, Photographer. This photograph is included in a Carte-de-Visite sized photograph album which features the extended relatives of the Atherton and Winder families from Illinois, Kansas, Ohio, Oklahoma, and Pennsylvania. Almost all images are identified. The album was purchased at an estate sale by Kathleen McKenzie of Pittsburgh, Pennsylvania. No provenance or other historical information is known about the album other than its contents, which have been preserved and digitized in original order for contextual clues. If information was written on the album page, the page itself was scanned first, followed by the photograph front, and then by the photograph back if it also contained information. Though Kathleen maintains ownership of the original album, she has given permission for the photographs to be made available digitally for the use of family and local history research. Digital scans and archival notes made from the original album by Candice Buchanan 8 December 2014.